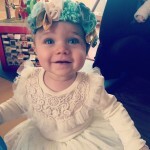 I wanted it to feel special, even though I know she would have been happy with the sweet little family celebration just the four of us had on her actual day. After doing some research I found the perfect venue. 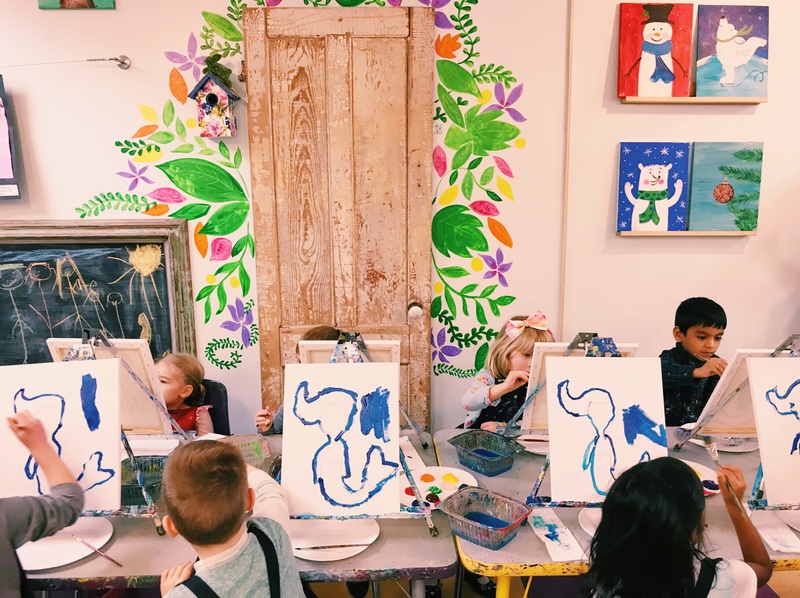 Because her Birthday falls during the winter break, I wanted the kids to be able to do some kind of meaningful activity, something fun, but also educational. And Sofia LOVES art. 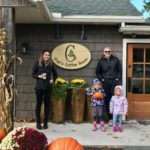 I was blown away when I discovered The Giggling Pig, an art and party studio with a location in Bethel, CT and Shelton CT. They also offer at home parties! 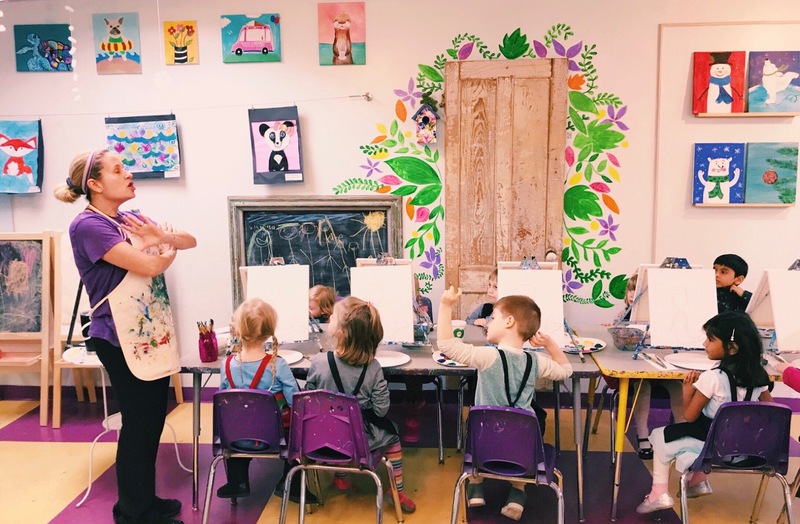 From art classes, after school activities, to art camp, and paint and sips, I was impressed by their educational offerings, so I decided to host her party there sight unseen, and it exceeded all my expectations! In case you’re still not sure, the theme for the party was donuts. 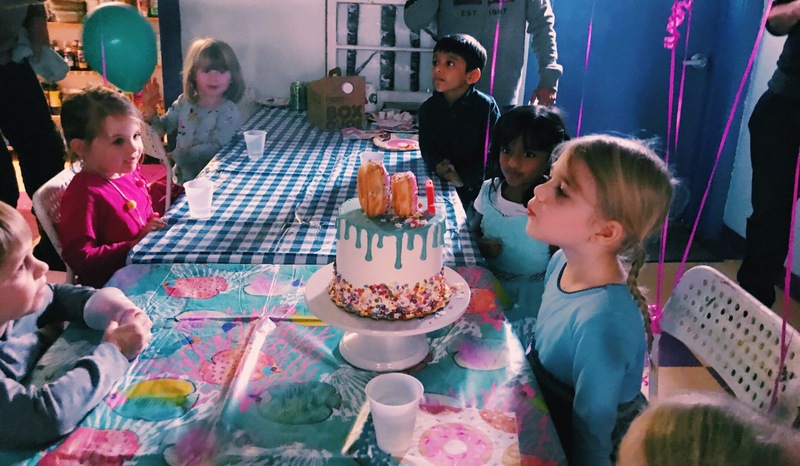 Donut worry be happy, but of course I was worried about how I’d manage setting up the space and cake table with my two toddlers in tow. The manager at The Giggling Pig, Sherie, and her assistant helped us the moment we walked in the door. It was such a breeze, they entertained my girls with arts and crafts while my husband and I set up, and helped us finish the set up in time for the guests arrival. 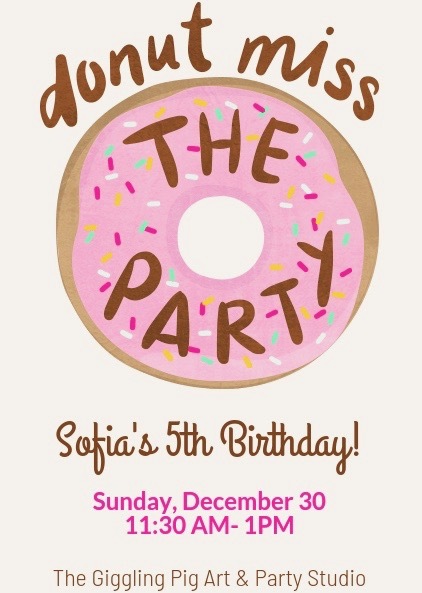 So back to the donut theme… it started with these cute donut miss the party invites from Evite. 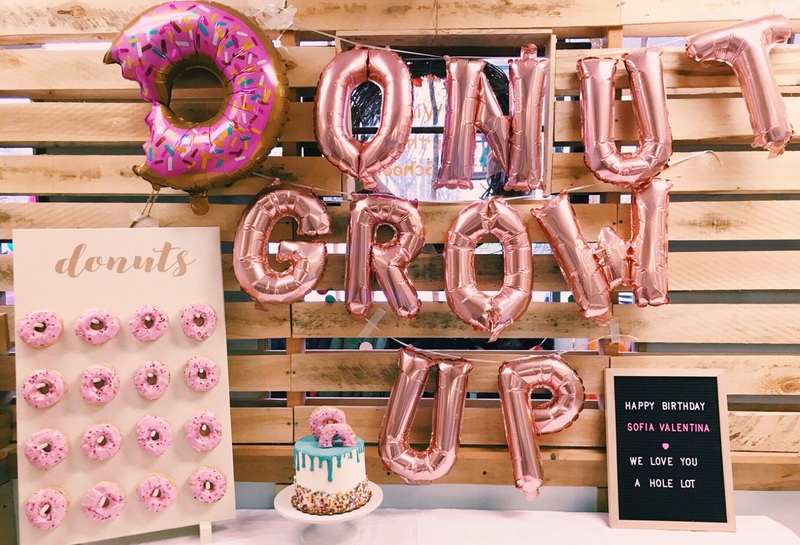 Then I had ordered rosegold balloons to spell donut grow up which we carefully inflated at home and my darling husband hung on the wooden plank wall above the cake table (yes he thinks i’m nuts). 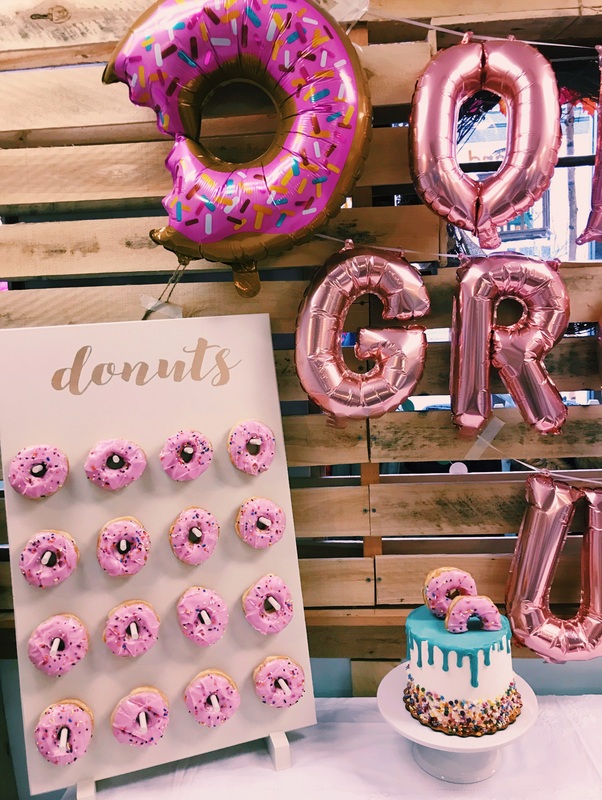 I also decorated the cake table with my letter board which spelled out another donut pun (we love you a hole lot). Most donutty of all, I got a handmade in the USA wooden donut wall from CoogeeStudios, which is an adorable mom-owned etsy shop in Colorado. 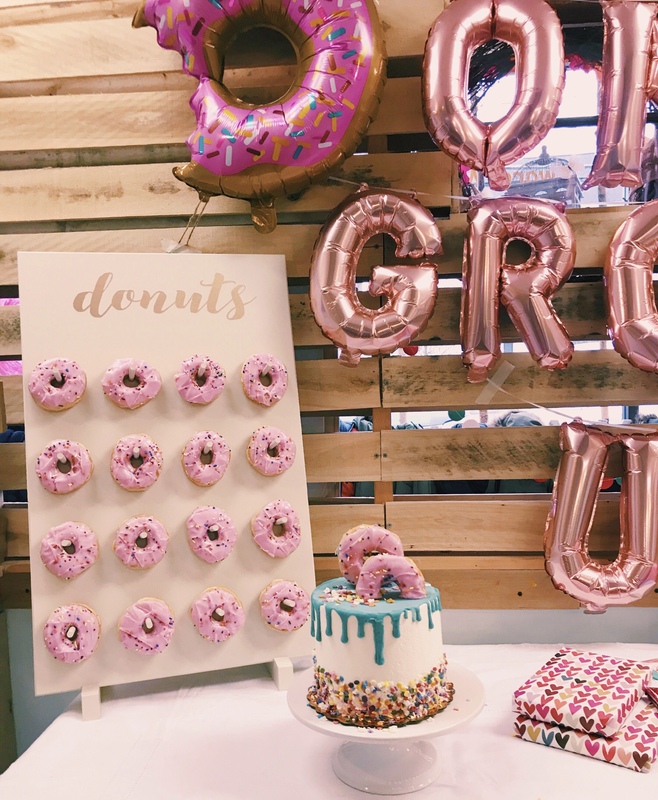 The owner Lauren created an off-white donut wall with gold lettered ‘donuts’ on top and the skinny pegs. I ordered two dozen strawberry frosted donuts with rainbow sprinkles from Dunkin and hung them up on the donut wall. 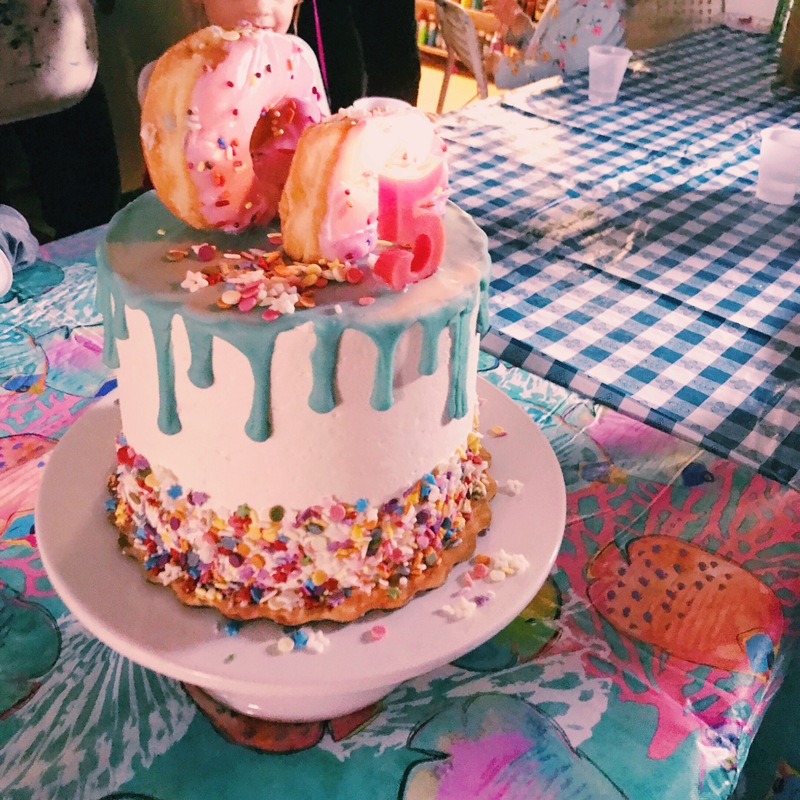 The cake is a double six inch vanilla buttercream cake with funfetti sprinkle frosting in the inside, and rainbow sprinkles on the bottom third of the outside of the cake. I also had them add a turquoise drip frosting effect on top. I love ordering custom cakes from Whole Foods- they use natural coloring, and the cake not only looks great, it tastes amazing. 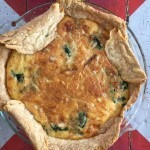 It’s a delicious dense cake made with all-natural ingredients and zero artificial flavors etc. Plus they only need a 48hour heads up. 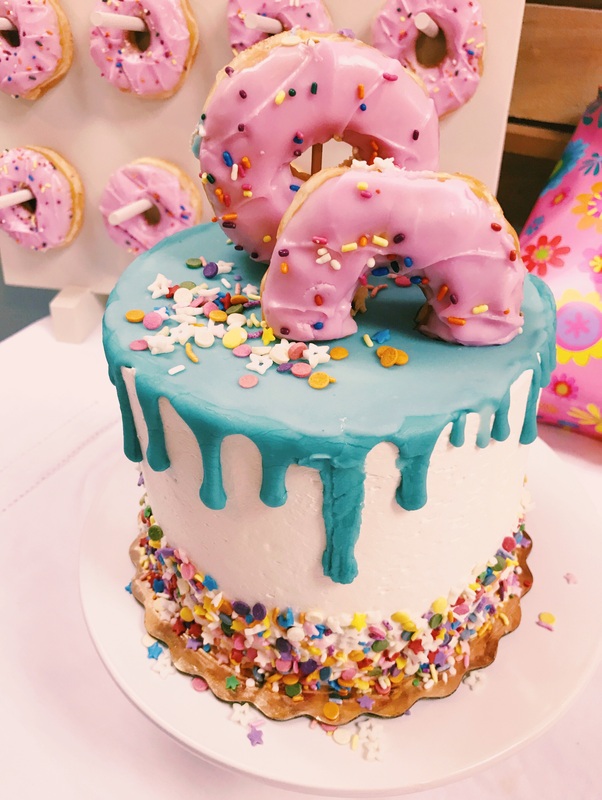 I added a donut and a half as a cake topper with skewers. 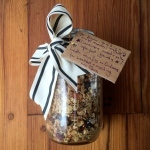 That took about one minute and is possibly my best Pinterest mom moment of all time. 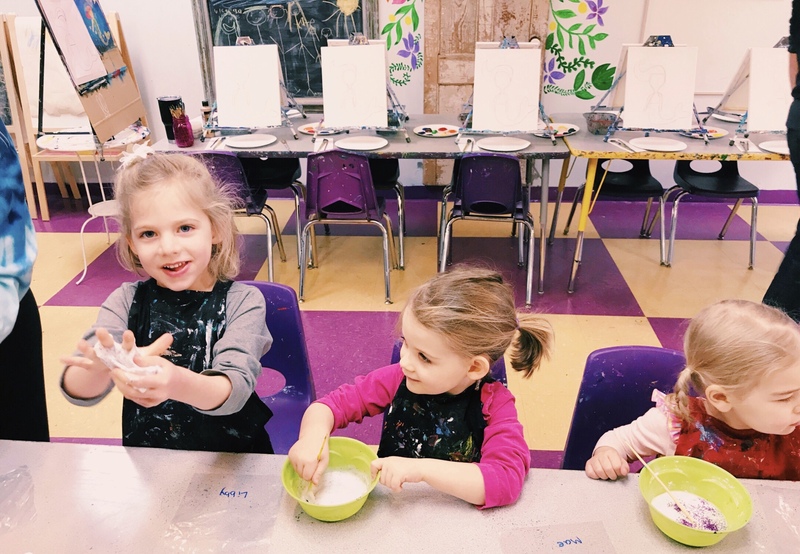 When the guest arrived, the kids were offered a smock, and guided to the first activity, making their own slime! How fun is that? 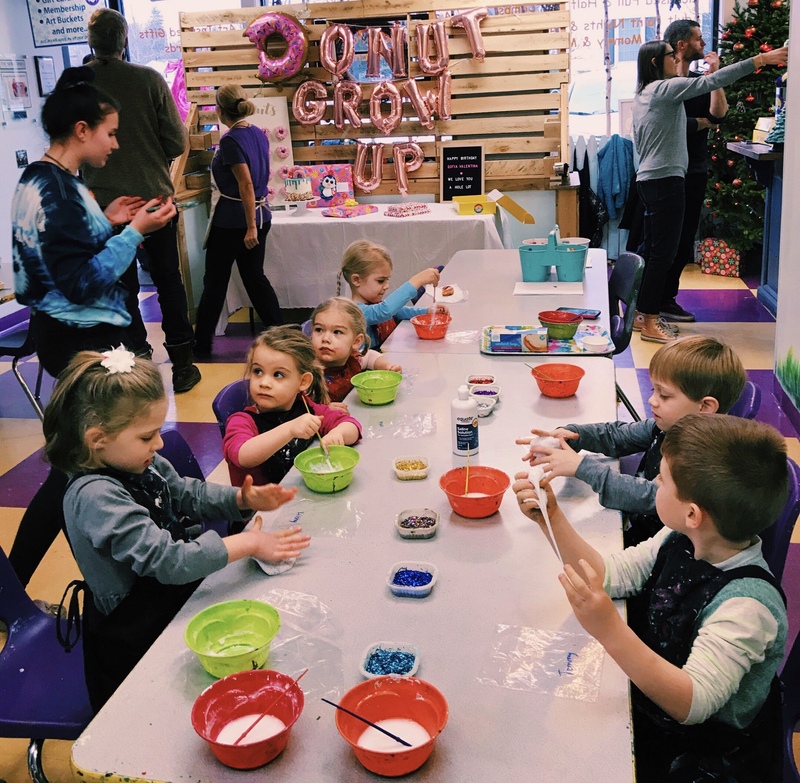 The kids loved it, with glitter and baking soda they made glittery squishy slime and got to take it home with them in a little labeled bag. Meanwhile I had a box of Dunkin Donuts coffee and La Croix out so the parents could chat with each other and drink coffee or seltzer. 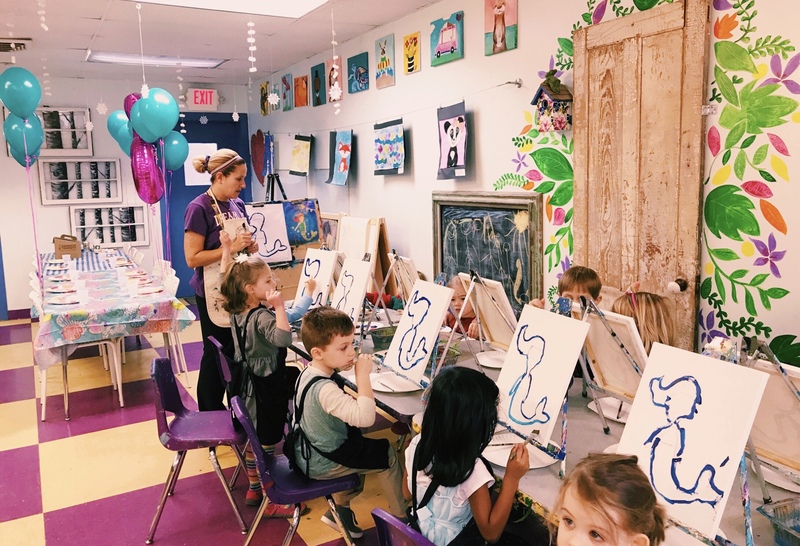 Next up was the main party activity: guided canvas painting! Tables was already all set up for the ten kids with easels, paints, and quality canvases. 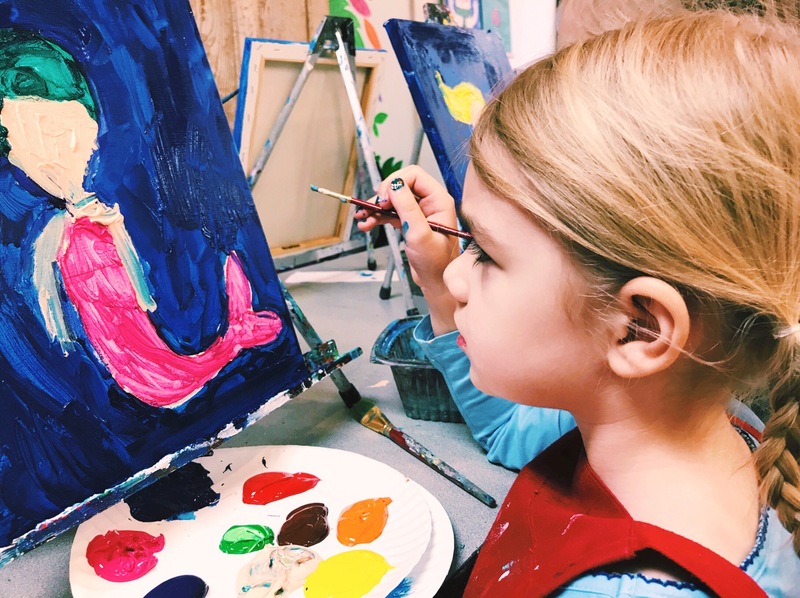 Sofia had selected a mermaid as the image, and Sherie started guiding the kids step by step through painting a mermaid. I was so impressed with her teaching method, and her fun way of capturing the children’s attention. 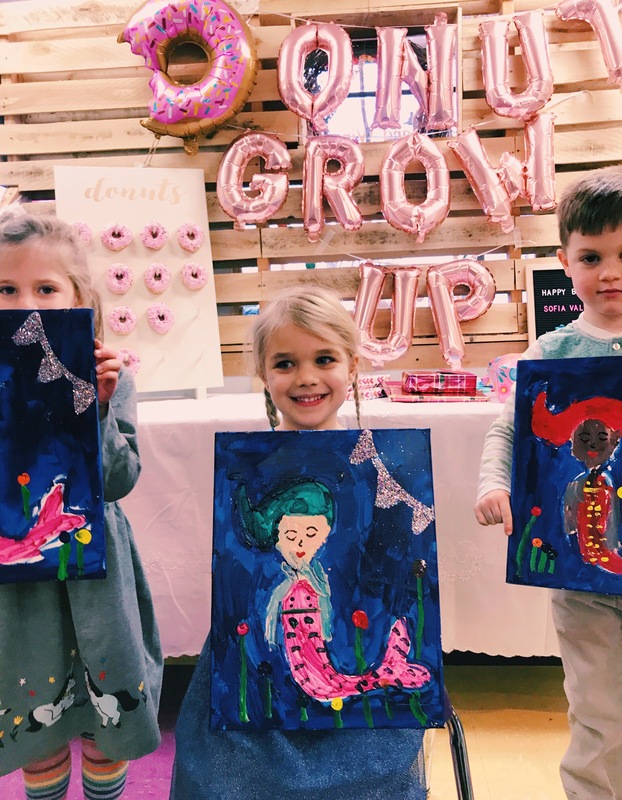 From explaining how to outline, to customizing their mermaid tail, the kids were enraptured and soaked it up. All of them did such an incredible job and were so focused and proud of what they were creating. Even my two year old painted the canvas at her level (with daddy’s assistance) and she was so proud of her work. And our youngest guest who was under 2 did a beautiful free style canvas. 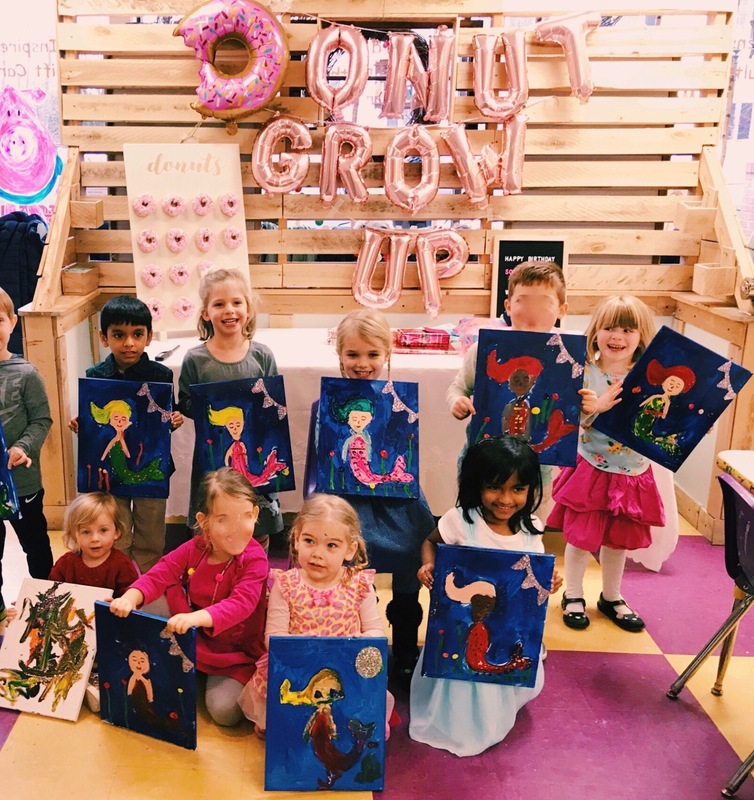 Sofia and her friends got to choose their own colors for the different details of the painting and had a little stretching break, and once they were done, Sherie and Anna added face features and a glitter detail and laid the canvases out to dry. After washing hands, it was time for pizza! 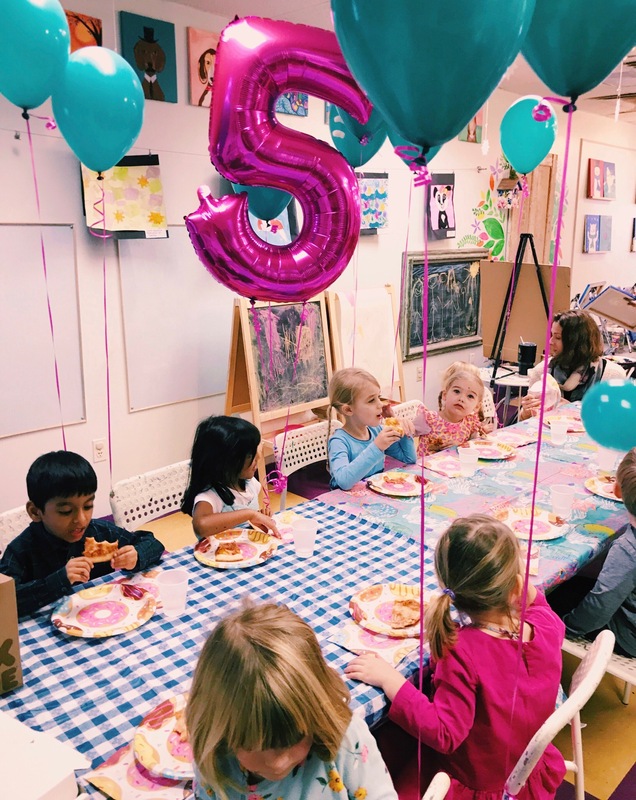 The Birthday party package includes two slices of cheese pizza for the kids which is perfect, and we ordered an additional veggie packed pizza for the parents, because who doesn’t love getting home from a party and not having to rustle up food. After pizza, the lights were dimmed and I brought the Birthday girl her donut cake! I used donut paper plates for pizza and cake, donut printed napkins, and instead of plastic forks, I got little wooden forks which worked out great. We tied teal balloons with magenta ribbons to each chair at the eating tables. The kids loved having the balloons floating above them. The Birthday girl got two teal balloons, and a giant metallic pink number five balloon. 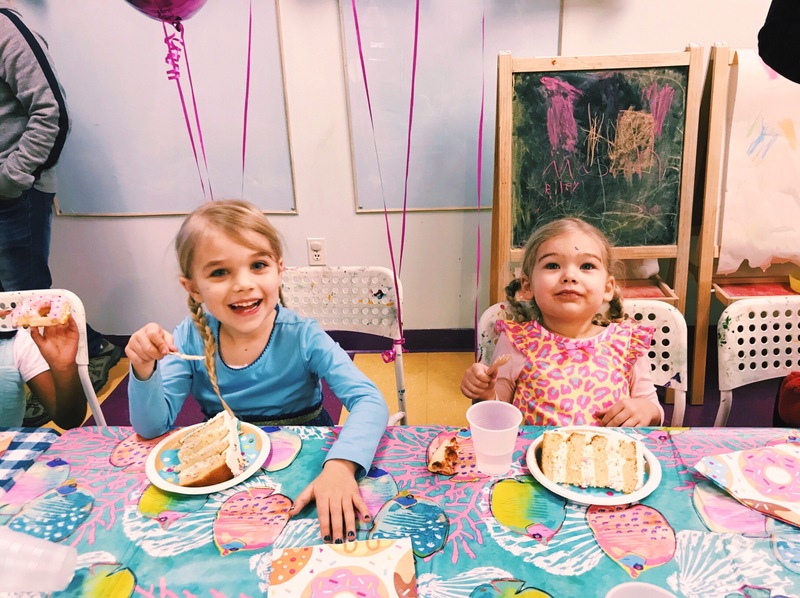 The kids got to pick between donuts or cake, and there was plenty of dessert for the adults as well. The entire cake was gone by the end! After dessert, the kids all posed so proudly with their canvas, which they got to take home with them. And I didn’t have to break my head about goodie bags, as they each got their painting, their slime, and a balloon! For more party pics and inspo, follow me on Instagram @livlunamasha and watch my IG Stories for behind the scenes into my nutty colorful girl mom life! 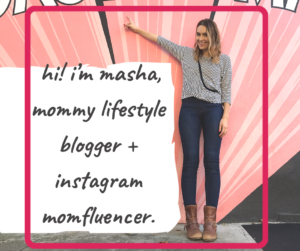 i’m masha, a girl mom of two toddlers, digital marketing maven, and bookworm. i stay up way too late when the littles are finally asleep, drink copious amounts of coffee, and rarely work out. 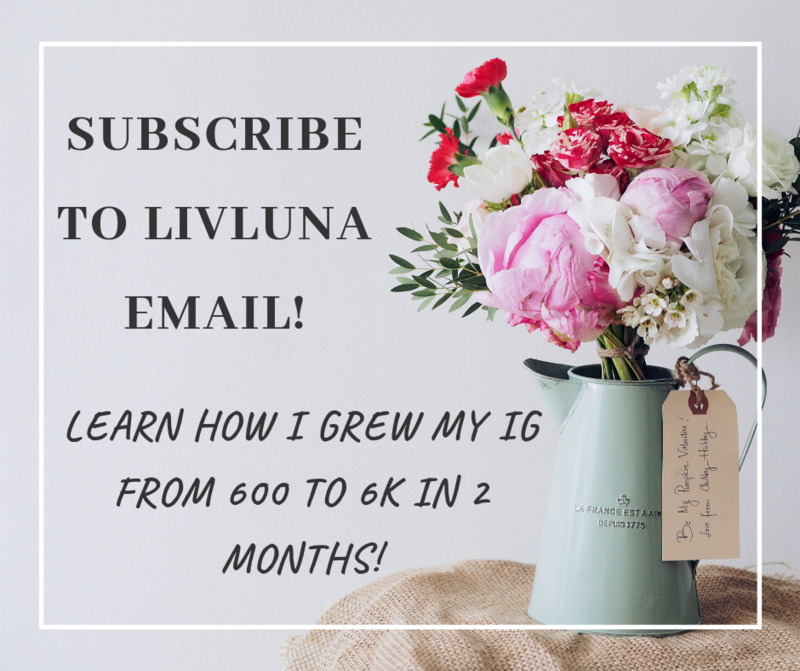 i’m passionate about inspiring mamas to create and grow fulfilling and lucrative side hustles on instagram!